One of the most popular social media apps, Instagram, has been growing in popularity so much that some users have even been abandoning their Facebook for it. Now, an Instagram-type app has found a niche community for people who need to use the photos for research that goes further than what you're wearing or what you ate today. 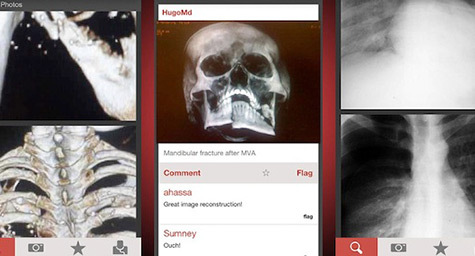 Enter Figure 1, a photo-sharing app for doctors. This is part of a normal day for some people, and now, they can team up to give better care. Because some of you obviously need it. However, according to theverge.com, some of the images can be quite beautiful in their uniqueness or oddity. They're also often not bad as warning shots to regular folks, like patients who suffer injuries from hardware mishaps or other DIY destruction. X-rays, raw injury photos, and surgery before-and-afters are all featured, tagged and organized by anatomy and specialty. Wounded? Why not add a skull selfie to the rest of your internet photo collection? It also brings a challenge to all types of medical professionals. Some 2 million images a day are viewed via the app, and it expands the horizons of those who often make a career of focusing on singular elements of an affliction. James Sacrant, a radiologist, explained, "As a specialist, your focus can really narrow down, and the conversations on here help to round that back out." Like other social media platforms, commenting and "favoriting" is a thing on Figure 1, too. "It feels like the lingua franca of medical professionals involves looking at things, analyzing, and collaboration," says Andy Weissman, an investor. But don't worry about non-doctors writing up weird cures to try to fix the odd issues: only medical professionals are allowed to comment, and each are individually verified. Regular folks are still allowed to check out the imagery, though, so if you feel like watching in on the diverse damages uploaded to a worldwide virtual medical theater, Figure 1 offers no shortage of fascination.